Prior to the DOE meeting each Phase I or Phase II report has been evaluated by the regional Archaeological Reviewer. At this point, the assigned reviewer has made their determination and either agrees or disagrees with the consultant’s (CRM firm) findings and recommendations. The DOE meeting is used to defend the reviewer’s evaluation of the project to the others in attendance. 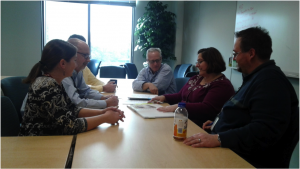 The meeting is attended by all three Archaeological Reviewers (Kira Heinrich; Western region, Steve McDougal; Central region; and Mark Shaffer; Eastern region) and the division chief of Archaeology and Protection (Doug McClearan). Keith Heinrich (the Western Region National Register Reviewer) and Noël Strattan (CRGIS Coordinator) often attend these meetings too. Almost all of the DOE meetings we have attended have been after the Phase II has been completed. The staff go over site mapping, sampling strategies, testing strategies, soil integrity, feature context, and they discuss whether or not the site adds data that contributes to our understanding of the past, thus eligible for inclusion in the NRHP. Their recommendations are congruent with the Guidelines for Archaeological Investigations in Pennsylvania and are based on the site’s significance and integrity, or lack thereof. At least three of the reviewers must agree to the determination and sign-off on the DOE certificate. Usually this is a straightforward process and there is really no back and forth arguing. After all, they have been doing this for years and they make sure the consultants are following the guidelines. Fortunately our state has a solid and strict reputation, most contractors abide to the guidelines, and most times consultants ask PHMC reviewers for feedback. Unfortunately at times the reviewers have made the evaluation that the contractors work scope hindered their ability to appropriately evaluate the property. In these cases the consultants are sent back out to complete more work because they didn’t reach the minimum required for evaluation under the Guidelines. I have to say that these type of DOE meetings were the most educational for me because you can learn a lot by never repeating mistakes of others. Photo 1: DOE Meeting at the SHPO. From left to right Hannah Harvey, Doug McLearen, Steve McDougal, Mark Shaffer, Kira Heinrich, and Keith Heinrich. 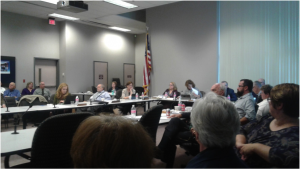 On October 4th we attended the PHPB meeting in the Rachael Carson Building in Harrisburg, Pennsylvania. This was a different undertaking from the DOE meetings because these were all above-ground resources, therefore we heard arguments for eligibility on the basis of all four criteria of eligibility. There was a total of eight properties that were nominated during this meeting. The process on average takes about a year to complete, sometimes a little longer for the non-professional. A National Register Form is completed and submitted to one of three National Register (NR) Reviewers. Like Archaeological Reviewers the NR Reviewers are divided by region (Keith Heinrich: Western Region, Dave Maher: Central Region, and April Frantz: Eastern Region). Each NR Reviewer receives dozens of NR forms yearly and works closely with the individuals submitting the form. The exact numbers are not yet ready for the year as staff is still working on the annual reports, but it is estimated that three-quarters of NR nominations are determined ineligible by the reviewer before going to the board. Only some of the eligible properties have an actual nomination submitted and move forward through the process. Therefore, the board only receives the strongest nominations. The primary responsibilities of the 15 member board is to review NR nominations and nomination appeals before they are sent to the Keeper of the NR. 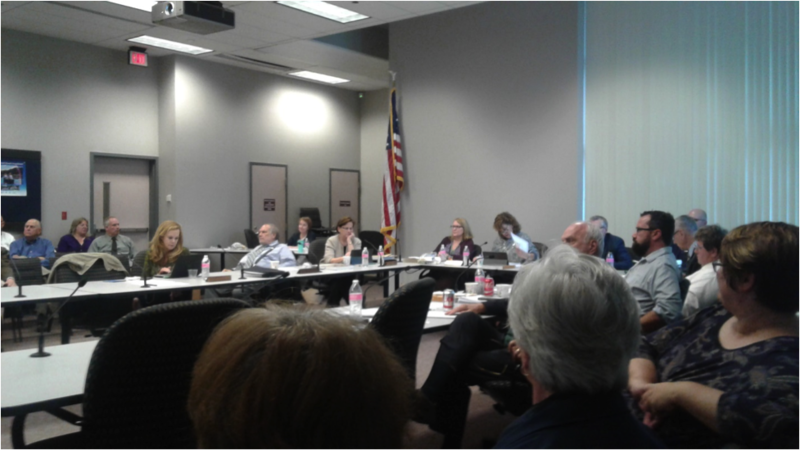 Prior to the meeting each board member has reviewed the NR Form. During the meeting a NR Reviewer makes a power point presentation of the nominated property highlighting the strengths for inclusion in the NR. Upon conclusion the reviewer pronounces to the board that they strongly recommend the property be listed on the NR. Board members then make their comments on either the strengths or weaknesses of each nomination. After the board makes their comments they ask for comments from the public. The Board supported the nominations for eligibility on all eight properties and they will be passed on to the Keeper of the NR. This is usually the case during these meetings. After all, the NR Reviewers have selected these among others as presenting the best case for inclusion in the NR. The most rewarding aspect of attending the PHPB was the exuberant faces of the individuals responsible for nominating the properties. For them it is the payoff of a lot of research, constant revisions to NR Forms, and plenty of patience. However the board’s determination is not the culmination, as the property is now in the hands of the Keeper of the NR. Photo 2: Andrea MacDonald leading the Pennsylvania Historic Preservation Board Meeting. List and Links to Pennsylvania Historic Preservation Board Meeting nominations. 4- Rueben & Elizabeth Strassburger Farmstead: No link found. 8- Twin Bridges Historic District: No link found. The NPS regulations in 36 CFR 60.4 established the criteria of eligibility for the National Register of Historic Places (NRHP) and explains four (A, B, C, and D) NRHP Criteria for Eligibility. Criterion A is for sites associated with important historic events “that made a significant contribution to the broad pattern of our history.” Criterion B is for sites “that are associated with the lives of persons significant in our past.” Criterion C is for buildings “that embody the distinctive characteristics of a type, period, or method of construction, or that represent the work of a master, or that possess high artistic values, or that represent a significant and distinguishable entity whose components may lack individual distinction.” Criterion D is for sites “that have yielded, or may yield, information important in prehistory or history.” D is the most important, and used, criterion for both historic and prehistoric archaeological sites. The eligibility criteria leaves ample room for interpretation with regards to what resources are determined to be eligible for inclusion and how it may be interpreted.